Custom Imprinted Globe Beach Balls at low prices. pole to pole. Globe Beach Balls may not be correct or accurate. Color of balls subject to change. Black, White, Silver, Orange 1665, Brown 469, Gold, Yellow 107, Dark Green 343, Green 328, Teal 320, Baby Blue 292, Navy Blue 281, Royal Blue 2728, Purple Violet C, Pink 211, Burgundy 209, Red 186. NOTE: Beach Balls are measured from one pole along the curve to the other pole. Dimensions are approximate. CUSTOM ARTWORK/LOGO/: Please provide ready artwork in vector format 300+ dpi and email it to us in (.eps, .ai, .pdf) files. To EMAIL your artwork to us, click here. Pantone Color Match (PMS): Add $40.00 per color. Exact color match can not be guaranteed. Recommendations: Please indicate which color globe on your order. Do not inflate using air compressor. SPEC SAMPLES: $50.00 for 5 beach balls with one color, one side imprint per item #. Each additional color and side $50.00. GB12 - $1.80 each. GB16 - $2.30 each. (Minimum order for uniprinted balls, $100.00) and are shipped within two working days. Random samples $9.50 each to cover cost & shipping. • An ideal promotion for travel agencies and cruise lines. • Also, great for environmental and ecological groups. • These Beach Balls will make a world of difference in your next promotion. 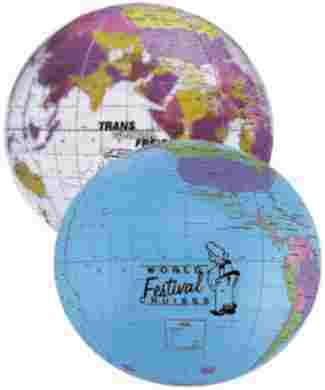 This Globe Beach ball is a great specialty for company picnics, schools, family reunions, the beach and all youth-oriented institutions. Watch your ad message soar! Add $0.40 per color, per imprint. 4 spot color max. For 3-4 color imprint 250 piece minimum. 12" - 3 3/8" Diameter, or approximate 2" x 3 3/8"; 16" - 3 7/8" Diameter, or approximate 2 3/4" x 3 7/8", depending on layouts. Bulk. 12" approximate 29 Lbs./250. 16"approximate 31 Lbs./250 Globe Beach balls. From receipt of complete order and approved artwork, please allow approximate 13-14 working days production time in the plant on customized merchandise, unless otherwise noted. E-mail to Customer Service, click here.